This special feature has been written by DAM News contributing editor, Ralph Windsor. See also Social Media Part 2 for the second part of this article. In our discussion of the DAM Value Chain, one of the topics mentioned as being of significance was Social Media. This is even more of a sprawling neighbourhood than Digital Asset Management, so to cover the subject adequately, I have split the article into two parts. Part One will deal with applying Social Media concepts to DAM and Part Two is about DAM being used in conjunction with Social Media platforms (i.e. Facebook etc). The interest in DAM and Social Media is, in part, due to its current status as a fashionable subject in the wider digital sector. 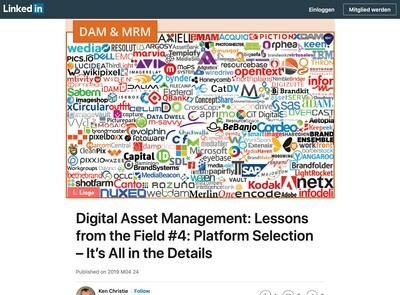 That can create complications where users do not approach the topic in terms of what they want to achieve, but rather from the perspective that they must have a Social Media element to the Digital Asset Management services they need to implement. As is common with the rest of the tech market, this can lead to a lot of box-ticking and over-rationalisation of features without due consideration of the objectives in mind for integrating Social Media with DAM. Social Media already has momentum and the value offered is understood by a sufficient number of people to ensure it will persist as a concept for the foreseeable future. 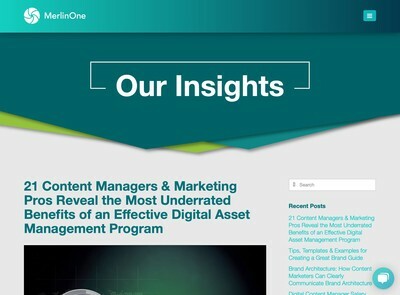 The aim of this article is to prompt you to step back and consider the issues objectively so you can avoid making hasty decisions based on conjecture or misunderstandings about what Social Media means in the context of Digital Asset Management. If we are going to analyse how Social Media fits into DAM, this is a valid question. A working definition would be that it enables the use of digital communication technologies to facilitate dialogue between individuals. Many of the technologically oriented definitions I have encountered use examples like comments, sharing media, user generated content etc to illustrate what Social Media is all about. The key theme is the interaction between an originator and their audience. With Social Media, the two are no longer separate, the audience can become active participants if they choose to do so. Similarly, the originator is encouraged to respond and maybe even adapt their work based on contributions by the audience. The progression of Social Media has moved along two distinct paths. The first I have already discussed, it is using ‘social’ techniques, like comments or ratings etc. The second is a purer form of Social Media, where an on-line community’s sole purpose is to facilitate direct interaction between users – or ‘Social Media Platforms’ you might call them. 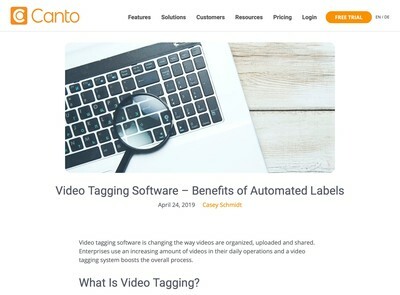 These are represented by some familiar brands such as Twitter, Facebook, LinkedIn and so on, as well as some more media-specific examples such as YouTube or Flickr for video and images respectively. These forks cross-influence each other, so innovations in web media and applications interfaces might end up being used in Social Media web properties and vice versa too. How might Social Media influence DAM technology? What happens to digital assets when they are introduced to Social Media platforms? As I will explain, enabling some Social Media features on your DAM solution can have implications you might not have initially anticipated. Equally, anyone planning to ban all their digital media from being used on any Social Media platform because they seem high risk stands to lose out on a substantial marketing opportunity too. There is an ever-present potential for unpredictable events which can have both positive and negative consequences for your digital assets in respect of Social Media. You need to develop practical strategies for managing them so the downside risk is mitigated without impacting the upside. That means understanding precisely what they can do and how they apply to your situation. DAM systems are usually centred around two fundamental entities: assets and users. Social Media features for DAM can be derived by connecting them together along a timeline of user initiated events to produce what you might term ‘Social Metadata’. They are relatively easy for vendors to develop and have the benefit of giving end users something which they are likely to be more familiar with. Hosted or SaaS vendors especially are delivering the interface to their systems through a web browser client and are therefore aware that their products will be viewed alongside established sites such as Facebook, Amazon etc. This offers them associative benefits that they want to be able to leverage to help increase the familiarity and perceived usability of their interfaces. If users are already familiar with certain Social Media conventions then this reduces the overhead required to get up to speed in a DAM system that also uses them. As I have discussed before, many marketing managers (who are now the largest single target market for DAM) blur the distinction between DAM systems as a utility application and a form of marcomms in their own right so these in-turn enhance demand for Social Media capabilities. For DAM vendors, Social Media features can offer good ROI in terms of demonstrable benefits of their products as they show live and tangible communication in action – whether the same is true of the end users, however, is not always so straightforward. Matthew raises some good points. It is important to understand that he is presenting a selection of features and associated Social Media tactics which you might choose to apply to your circumstances where suitable. He is not necessarily advising that you use them all and (as the client) it is ultimately your task to make the decision about the suitability of each. Buyers of DAM systems rarely argue with the need to improve staff collaboration and if this is framed within the context of Social Media then it will normally be particularly well received and get nods of approval during meetings. A potential issue with some Social Media features in DAM is that not all of them might get used to the extent that is hoped. There is a risk that a few might just become gimmicks that end users ignore post-implementation. In a typical business or professional environment, the level of collaboration in DAM tends to be inversely proportional to the number of participants involved with a given task. Therefore, with usage approvals or commenting on artwork where the employees are required to respond as part of their job, there will be more active involvement. Even then, however, some might be reticent and save anything controversial for a phone call or face to face meeting. When the feedback is open and available to anyone, such as offering comments or ratings about assets, participation often declines. It must be said that a lot depends on the culture of the organisation where the DAM solution is being used also. In my experience, businesses users tend to be less motivated to provide open feedback and where it does occur, it is from a more vocal minority who monopolise the discussion and whom tend to have highly polarised opinions also. 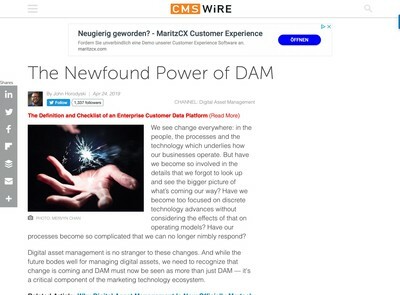 When HR managers are presented with Social Media dialogues in the interfaces of DAM systems (and other collaborative software too, it must be said) there is often some concern about what the business might be opening itself up for. Their willingness to veto a given feature due to the litigation risk posed by what some wayward member of staff might decide to say to a colleague should not be underestimated. Another issue is that keeping up to date with Social Media interactions can occupy a lot of time. I don’t think I’m alone in finding staying up to date with Twitter, LinkedIn etc to be quite a challenge when it has to be balanced with what you might call ‘real work’. If you add another layer of this provided by your DAM system (as well as basic email communications) it is easier to see why the appetite for Social Media interaction in DAM often gets limited to the essentials where there user involvement is mandatory. A further consideration is lack of motivation to participate due to low levels of interest in the subject matter – the assets themselves. DAM vendors tend to overestimate how interested users will be in spending time using their products. It is an unwritten rule in many businesses that you need to (at the very least) pretend to be interested in some assets like recently released marketing collateral by the mere fact that you are an employee, even if has no direct relevance to all those TPS cover sheets you’re going to need to fill out again this afternoon (and presumably the alert memo sent out automatically by the DAM system that you failed to read too!). Most staff in medium size or larger organisations want to turn up, get their files and go again so they can get their job done. They do not regard their DAM system as being like Facebook (or even LinkedIn). The Social Media and related collaboration capabilities in DAM systems have potential to be more engaging and therefore increase wider participation but there is still a lot more work required to make the experience useful and worth bothering with for a typical end user. Some have proposed that you can use concepts like gamification to make things a bit more interesting. I suspect that unless you are going to be able to come up with something either very clever or spend a small fortune on making it compelling from an audio-visual perspective, it won’t take users long to get bored by that idea too before long either. The big USP for DAM is enhanced productivity, i.e. going home on time and getting more work out of the way. Any Social Media features need to improve that not divert user’s attention from the task at hand or frustrate their workflow. There is a school of thought which argues that DAM should be a purely back-end tool that drives the media library capabilities of other software (i.e. as a suite of digital asset management services). This presupposes that the Social Media collaboration must be happening more actively somewhere else since (in that case) the DAM system is rarely interacted with, except by a few administrator or other advanced users for whom these features would probably be of limited benefit anyway. In the long-term future of DAM and the DAM Value Chain concept we have discussed, that might eventually become a reality. However, in respect of the current use case for DAM, many web based products especially are used like independent applications that have a defined identity as ‘The DAM System’ rather than a component of some other tool. Those end users that need to take advantage of Social Media concepts now could (and probably already do) benefit from some of the features described in the quote from the article given above. While DAM vendors have successfully opened the door to Social Media oriented collaboration, it is more likely to be ancillary providers who will walk through it (and reap the benefits too). This is the DAM Value Chain in action right now and is further proof that in 2013 and beyond, if you are a vendor, you can’t successfully chase after everything. Evidently a careful balance is required where vendors need to answer the needs of their users, but also be aware that trends are probably moving against having one platform for everything. If you are an end user, you need a strategy for Social Media and DAM that considers both your immediate and long-term needs as well as realistic assessment about where exactly the most benefit will be obtained from applying these technologies. That means being reasonably hard-nosed about what Social Media features you enable and why. Even if they come bundled with the system itself so you don’t have to pay any extra, if you provide these tools, users will expect to use them. That generates both training overheads and some possible HR implications that you have to think about in advance. I have to stress that I am not advocating not doing Social Media with DAM at all, but you must go into it consciously and with a good understanding of how these features might get used and what benefits they will offer. In the follow-up article to this one, I will examine how DAM solutions can interact with Social Media platforms and some examples of how specialist Social Media feature services might be realised and how those might be delivered via the DAM Value Chain. Congrats! Great and relevant article.